Sarah CaskeyBangor University student, Sarah Caskey, 23, was the first woman to cross the finish line at the gruelling Snowdonia Marathon Eryri recently. Sarah, a second year undergraduate student at the School of Sport, Health and Exercise Sciences, emerged victorious, completing the 26 mile route in 3 hours 12 minutes and 06 seconds. A keen runner, she also came first in the Twin Piers 10k race at Llandudno and second in the Conwy Half Marathon during the last 18 months. Back home in Peterborough, Sarah also runs for the Peterborough Athletics Club and Blackburn Harriers. Rob SamuelThe School of Sport, Health and Exercise Sciences attracts and supports prize winning athletes who study the theoretical side to their sport. Graduate Rob Samuel, and former Athletic Union President won the men’s race in the Snowdonia Marathon Eryri for a third time in a row. Rob is currently events manager for Always Aim High Events, a local company who organise events such as the Slateman triathlon and Etape Eryri. Dr John Parkinson from the School of Psychology was also the first Welsh Veteran over the finish line with a time of 2:54:15, making him 12th overall. 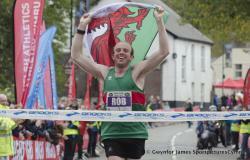 He is affiliated to the Welsh Athletics Association and a member of local club Eryri Harriers. Fellow Eryri Harrier Arwel Lewis, Security Coordinator at the University, was also first in the male over 55 category. He has taken part in the race ten times since 1988 and he was second overall 25 years ago with a time of 2:35:06.